The 1971 Plymouth Cuda received some minor changes from the 1970 model. The most prominent changes included a new grill (cheese grater) which included 4 headlights, new tail lights, and 4 fin like vents on the fenders. The 1971 model included optional billboard decals on the quarter panels which covered from the door to the rear of the car. These decals announced the engine size for 340, 383, 440, and the hemi. Also optional electrometric bumpers were available again this year. Interior upgrades include better seats with more grip as well as some different options such as split buckets. Other styling changes were minimal. However, these cars are likely the most sought after Mopar. 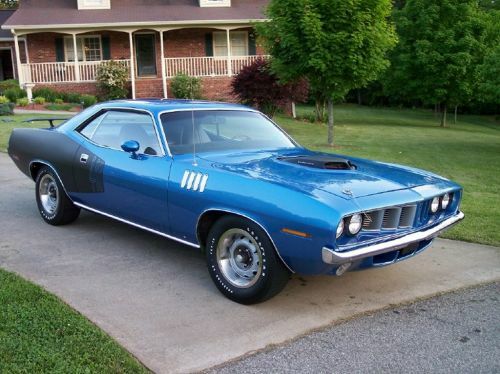 Note: 115 Hemi Cuda coupes and 7 Hemi Cuda convertibles were produced in 1971. Recent auctions place the value of a 1971 Hemi Cuda convertible in the 2-3 Million dollar range in 2006. Update: In April 2016 a Hemicuda convertible sold for $4.2 million!